Dr. Johnson is a highly skilled and experienced, board certified general surgeon. Dr. Johnson's area of expertice includes surgery of the breast, gallbladder, hernia and soft tissue. She received her undergraduate degree from Villanova University, Philadelphia, Pa., as well as, a Masters degree in Chemistry from Villanova University before obtaining her medical degree from Temple University School of Medicine in Philadelphia, Pa.
She completed internship and junior residency positions at Jackson Memorial Hospital, University of Miami, Fl. 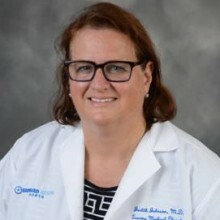 and senior and chief residency positions at Lankenau Hospital, an affiliation of Jefferson University School of Medicine, Philadelphia, Pa.
Dr. Johnson is a Fellow of the American College of Surgeons. Previous Associate Clinical Professor for Nova Southeastern School of Osteopathy and Physician Assistant Program. She has been an ATLS instructor since 1995.